The next phase in the Terminator franchise is coming and it holds the fate of all humanity in its hands. A true franchise in every sense of the word - the previous two Terminator films earned more than $550 million at the worldwide box office - Terminator 3: Rise of the Machines is one of 2003&apos;s most anticipated films. Arnold Schwarzenegger reprises his role (T-850 Terminator) alongside a new villain, the T-X Terminatrix. 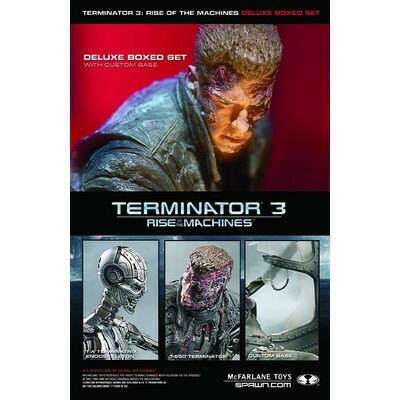 This deluxe boxed edition - in addition to a standard-scale series of figures and a deluxe 12-inch figure with sound - features a battle-damaged T-850 with sound, a T-X Terminatrix Endoskeleton and a custom helicopter diorama which re-creates a pivotal scene from the film. Battle-damaged T-850 and T-X Endoskeleton with custom diorama.